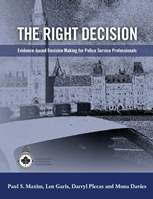 Police service professionals make crucial decisions every day that balance the needs of their communities with available resources. While understanding the invaluable role of police services, both the public and governance bodies are asking that decisions be based on hard evidence. Evidence-based decision making is a framework that pairs strategic planning with social and economic costing analysis, and it can be daunting. 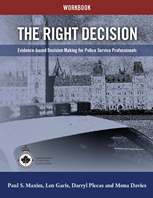 The Right Decision: Evidence-based Decision Making for Police Service Professionals is a manual and workbook commissioned by the CACP Research Foundation to help police leaders implement evidence-based decision making in their organizations. Readers are guided through the process of how to approach and justify difficult decisions and the accompanying workbook enables individual or group learning.